It can be difficult to know who to trust when it comes to choosing a contract machining partner for the electronics industry. One of the first things that you need to do is to consider the abilities of the precision machine shop, whether they have the capacity, the ability, and the equipment necessary to get the job done according to your specifications. The next thing to check is the reputation of the Massachusetts machining and assembly provider, to ensure that they can produce a quality product and guarantee delivery for specific lead times. One way to do this is to ask for references and actually contact the companies listed to ensure customer satisfaction. When quality really counts, it is vital that you identify the best machining specialists in Massachusetts to contract with for your project. Massachusetts precision machining services are all over the state in varying degrees of expertise and quality. The level of quality assurance that can be guaranteed, as well as the consistency of the business to achieve a high level of quality product, is essential for any company. AMI Machining employs a team of highly trained and experienced precision machining specialists at our Massachusetts precision machining shop. We have the technical expertise and manufacturing capacity needed to deliver just about any type, size, or standard to meet the needs of our clients as a contract machining partner. Our custom production team will work with your engineers to assist in the development of prototypes from the early design phase all the way to completion. We can help you meet all of your production deadlines while working to ensure quality management systems are in place to guarantee the best possible results. Our Massachusetts machining and assembly shop features a wide range of high-value, advanced equipment to provide our team with the tools necessary to achieve all of your goals. We have CNC machining at our precision machine shop for long and short run part milling, as well as CNC turning lathe centers, which can support close tolerances for large diameter pieces. We believe strongly in combining the abilities of our skilled engineers and technicians with state-of-the-art equipment and the industry’s best practices to deliver top quality results. In addition to production via our machining specialists in Massachusetts, our goal is to provide our customers with a true one-stop source for all of their machining and assembly requirements as your contract machining partner. We can offer complete electro-mechanical assembly and just about any other related services that you might require. 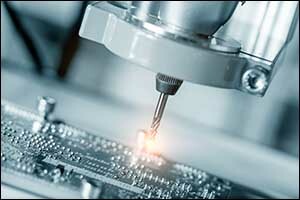 We work with a wide range of industries, but we specialize in machining precision components for the medical, telecommunications, semiconductor, industrial, aerospace, military, defense, and electronics industries. The services that we offer to our customers include manufacturing parts and machining precision parts. We strive to ensure on-time delivery and provide our services at a competitive price to help our customers to maximize the return on their investment. Efficiency and exceptional quality are what we work the hardest to achieve while working with each client on an individual basis to reduce costs for our Massachusetts machining and assembly services at AMI Machining. We are proud to have earned a solid reputation for providing long and short run part milling at our facility as a contract machining partner. Our technicians use vertical and horizontal machining centers to meet the requirements of our customers. We are able to machine five-axis and machined parts up to 84-inches in length and up to 40-inches wide. Through our many years of experience as machining specialists in Massachusetts, we have collected a large stock of tooling and gauging and use Coordinate Measuring Machines (CMMs) and comparators for quality inspection and to achieve greater control. Our CNC turning lathe centers can turn pieces at close tolerances. Through the knowledge and expertise of our technicians and machining specialists, we are able to provide Massachusetts precision machining that exceeds expectations. Our team has the ability to use extensive resources, including tooling and gauging, for all of our high-performance turning machines. Turning capabilities between .015 and 16.5 inches in diameter are available via our turning lathes, and we are able to accept up to 3-inch bar stock through the spindle. If you are interested in learning more about Massachusetts precision machining, production and assembly at AMI Machining, give us a call at 508-947-1192. Speak with our engineers about your needs for Massachusetts machining and assembly. We can provide you with a FREE estimate for the services available at our precision machine shop.